When the Olympus E-3 was featured last December, the 11-point dual cross (44 point) sensor stood out from the crowd - in speed and accuracy. As pointed out in that article, Olympus needed to move as much of the E-3 technology as possible to their regular DSLR line as fast as possible. When Olympus announced the E-520 just a couple of months ago it appeared Olympus might have done just that. It does appear the new E-520 brings over a substantial amount of E-3 technology, but it does borrow form other top four-thirds cameras as well. It even brings over contrast detect focusing with 11 points from Panasonic/Leica. However, the 3-point autofocus that appears so dated is continued in the E-520. Where other DSLR manufacturers are now featuring fast 9-point AF modules, Olympus and Nikon still relegate 3-point AF to their entry models. This is somewhat surprising since nothing else about the E-520 is entry-level except the price. At $699 street price for the E-520 with the 14-42mm (28-84mm) kit lens, the E-520 competes with the Nikon D60 kit with VR lens ($699), Canon XS kit with IS lens ($705), Sony A300 kit ($599), and Pentax K200D kit ($699). The Sony A350 kit ($799) and Canon XSi ($799) are a small step up. There are even two lower priced models that compete in the Sony A200 and Olympus E-420 - both of which are available with the kit lens at around the $499 price point. This is an extremely crowded field, with many competing DSLR cameras in the price range from $499 to $799. The question then becomes whether the E-520 represents good value in this huge group filled with many excellent DSLR cameras. Olympus also markets a two-lens kit that adds the excellent and tiny 40-150mm (80-300mm) telephoto zoom. The two-lens E-520 kit adds just $100 to the total. Sony also markets two-lens kit versions of the A200, A350, and A350, but the telephoto premium is $200 in the Sony kits for the added 75-300mm (112-450mm) zoom. 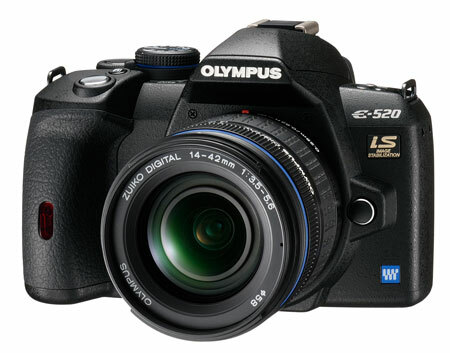 The Olympus E-520 is an upgrade to the E-510, which has been the biggest seller for Olympus in the consumer DSLR space. The new model adds processing improvements, more effective in-body IS (Image Stabilization) that works with any lens, and what Olympus describes as on-LCD Autofocus combined with Face Detection. These are the same updates that recently made their way to the tiny E-420, while keeping and improving the "IS with any lens" that was a standout feature of the E-510. Olympus describes the improved Live View technology as "advanced autofocus Live View enables photographers to compose their images and bring them into sharp focus on the HyperCrystal II LCD - just like a point-and-shoot camera." While Olympus did not provide much detail, it is now clear the new Live View on the E-420 and now the E-520 adds Contrast Detection AF to the Phase-Detection AF used in the last generation E-410 and E-510. This is the same technology used by Panasonic in their swing-tilt-swivel screen Lumix L10. Since Olympus pioneered Live View, which is now appearing on almost every new DSLR, it should come as no surprise that Olympus has enhanced Live View on the latest models to better compete in this fiercely competitive market. However, for now the new Contrast Detect Live View and face detect only works with a few Olympus and Panasonic/Leica lenses. Considering the fact Olympus added the Contrast Detect AF with just a Firmware flash to the lenses, it certainly appears Contrast Detect AF and Face Detection capabilities could be added to other lenses in the future with a firmware upgrade. I just prefer my ZuneCam because it's lighter! Is it just me or ya'll get the feeling that this place is owned/heavily sponsored by nvidia? Sounds like it may be interesting. I have to say that I would really like the new Pentax k20 when I graduate, but the new lenses for them start around $600. To get a 2 lens kit similar to what is available with this olympus, it's around $2300. I little on the pricey side for a definitely amateur photographer. Maybe in the next year, Olympus will upgrade their autofocus one more time. Disclaimer: I am an Olympus user and I like the cameras, but I try to keep very objective about camera brands as it doesn't help anyone to argue over them - just use what's best to you. Okay then. Wesley, AnandTech, I know you are not digital camera specialists and you're trying to give this a chance, and I appreciate the attention you're giving to alternative brands and other option, kudos there, but putting real trust in your reviews is somewhat difficult for me personally. There's a lot of speculation, missed points, incomplete understanding, and a general misconception of what's important and what's not in a digital camera. For example (this was what really hit me in this review) the white balance preset for Tungsten light is absolutely 100% completely inconsequential to actual photography. It's meaningless, just use a different preset or set the white balance so white is white, every modern camera can do this, and it's no merit or demerit of any of these, yet it got a good three paragraphs of attention in the review. Also, it may be important to you, but you lambaste the 3-point AF system as a true failing of the camera. While I find that's true if you use multi-point autofocus extensively, on every camera I've ever used, I just want the center point so I know where focus is going to go. It is certainly a limitation that people should know about, but it's not going to have the same importance to everyone else as it did to you. Not bad though, it's good to know. The paragraph on Image Quality was entirely about noise - this is not the only aspect of the image that people care about. What about color balance and appearance? Highlight and shadow rendition? Dynamic range? I'd love to hear more depth to this important bit. On the other hand, things about this camera that are truly important features were relatively ignored. What about in-camera image stabilization? Most people don't know how useful it is to have every lens stabilized. What about the dust-buster that really works, so you never have to clean the sensor? On the positive side, it's great to see a review on a large site that really focuses on the amateur average user and brings everything to a good conclusion. It's nice to hear it from a "Well, here's what I thought of it, let me show you" perspective. Plus, it should also be telling that real users such as yourself actually enjoy using Olympus DSLRs. I know I have, and convincing people of the validity of the E-system is always a bit difficult. Thank you for your reply, but I still disagree with your claim that focus points don't matter. If they truly don't matter then why does Olympus use 11 double-cross points (44 segments) in the E-3 and only 3 in the E-510. Why then, does Nikon use 51 points in their top cameras and only 3 in their D60, and why does Canon use more points as the price goes up? I do agree that the number of points really don't matter in thoughtful photography when you have the time and know what you're doing. However, in action, sports, or even photographing active kids the number of points and focus tracking definitely DOES matter. Try shooting sports or playing kids with a D300 compared to the E-520 and you will also be convinced. ANY kind of focus tracking is very difficult to impossible with just 3 points. Can you take great photos with just 3 points or even one point or none - of course you can, but that is not the point. My point was that in a comparison to other cameras in its class the E-520 falls short in the AF module, and that does matter in the marketplace. Almost every other camera with which the E-520 competes has more AF points, better focus tracking, and faster AF, and that definitely DOES matter to many buyers. In other areas like color accuracy Olympus does a very fine job. The E-3 AF is SO much better in AF that its a fair question as to why Olympus won't bring some of that technology to their new, lower-priced cameras. It would definitely make Olympus even more competitive. I did overemphasize noise, as you point out. That was primarily because Nikon and Canon users often unfairly criticize Olympus for their noise as Inherently the case due to the smaller 4/3 sensor. The real size difference between 4/3 and Canon's 1.6X APS-C is fairly minimal and I was trying to put that concern to rest. Olympus has done a good job of bringing the excellent image processing and noise reduction from the E-3 to the E-520, and I believe it is important to show that to the rock-throwers. As for white balance Tungsten performance on Auto WB and Tungsten presets I confess that is a pet peeve. If you only shoot outdoors or in a studio they really don't matter. However, amateurs shoot indoors without flash - which is one of the reasons they step up from a P&S. How an entry level camera handles indoor available-light shooting is VERY important, IMO, in evaluating a camera - particularly an entry-level camera. Of course photographers and those who understand color temperatures and how to set up Custom White Balance can deal with poor Tungsten balance, but it still is very time consuming. For first time DSLR buyers, however, orange tinted photos are often a mystery. In case it wasn't clear the Olympus Tungsten preset did a pretty good job. Auto WB in tungsten lighting, however, was about as bad as Canon and Nikon. Actually Sony does the best job of handling Tungsten under Auto that I have seen in current DSLR cameras. White balance settings don't matter at all if you're using RAW, in a proper converter. You can try setting a scene at any setting, and they will all become the same in the converter when the settings are changed there. But, when shooting JPEG, is sure does make a difference. Whatever setting is used determines the final quality. changing from one to the other can almost destroy the the image from a quality viewpoint. So I agree that whitepoint settings are very important if you shoot JPEC, as many amateurs sadly do. but for RAW shooters, it doesn't matter at all. I also agree that noise is very important. It determines the effective dynamic range of the camera. Thanks for justifying all that, great response and I appreciate it. I wasn't arguing that focus points don't matter, I definitely see the value in having more and better of them, but I was just saying that it may not be as important to everyone as it is for you. But I've decided I sort of like your injection of opinion into reviews and while it's a different style than you usually see online, it's refreshing as well. Keep up the good work. You bring a different perspective to camera reviews, and I appreciate it. I regularly read all the other review sites, but I actually look forward to your articles. Many reviewers tend to fetishize new technology for its own sake. You, on the other hand, actually evaluate whether a new technology is actually useful. Also, you take responsibility for your opinions as opposed to hiding behind statistics and "objective" tests which often times are quite useless to most photographers. You're not going to please everyone. Your article style is definitely not typical, but that's okay because we need a different voice in the camera reviewing universe. Compared to what? Everything other than Canon and Nikon?